Falls are the most commonly reported type of patient safety incident in healthcare. Around 250,000 patients fall in acute and community hospitals each year (NHS England, National Reporting and Learning System, 2013, 2014). Over 800 hip fractures and about 600 other fractures are reported. There are 130 deaths associated with falls. Although most falls do not result in injury, patients can have psychological and mobility problems as a result of falling. National Institute for Health and Care Excellence Falls: assessment and prevention of falls in older people, 161 (2013) guidelines now include patients admitted to hospital highlighting the need to address falls. The modules: module one for hospital based nurses, and module two for foundation level doctors provide interactive information about patient and environmental falls risk factors, the patient assessment, and post fall management. Both modules have been designed to complement, not replace, your local falls prevention policies and processes: you must always work within them. You can find out more about each module by selecting the modules below. This course has been revised in 2015 by the Royal College of Physicians, and the NHS England Patient Safety Lead, older people and falls. New for 2015 is an interactive tool to identify environmental risk factors. It covers patient risk factors (cardiovascular, balance, confusion, bone health, medication, vision and toileting); environmental risk factors (patient environment, special equipment and special observation) and what to do after a fall. It concludes with a case-study based exam, which requires a score of 75% to pass. The course has been funded by NHS England. It was developed by the Royal College of Physicians, and supported by NHS England. This CareFall eLearning package supports most of the recommendations within Falls: assessment and prevention of falls in older people. In addition, it also supports the recommendations relating to adult in-patients with Head Injury. It is also in line with the statements on analgesia and surgery in the Quality Standard for Hip Fracture. The course contains case-studies for you to work through, and prompts you to think what to do next using stop/start videos. It asks you to set your own objectives and to reflect on what you have learnt once it is completed. The aim of this course is to give you the knowledge to identify risk factors for inpatient falls and how to reduce them, to safely give guidance on moving patients if they have fallen and assess them for a serious injury. Explore clinical tasks related to post fall management and falls reduction. 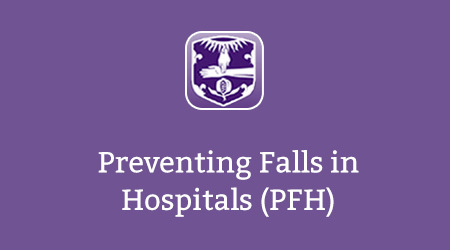 It has primarily been developed for foundation level doctors working in acute or community hospitals, but other staff members with an interest in falls risk reduction can use it. If you already have an account with e-LfH, then you can enrol on to the Preventing Falls programme by logging in to the e-LfH Hub, selecting My Account > Enrolment and selecting the programme. You can then access the programme immediately in the My e-Learning section. The Preventing Falls programme is also available to NHS healthcare staff via the Electronic Staff Record (ESR). Accessing this e-Learning via ESR means that your completions will transfer with you throughout your NHS career.